Liu Aifan is a seasoned transaction advisor who has focused on cross-border projects between China and the rest of the world in the technology, real estate, industrial and mining sectors for more than 20 years. She was instrumental in a $850 million acquisition by a Chinese investor of a leading Australian mining company, a $300 million acquisition by a Chinese investor of a leading auto parts company based in Germany, and an acquisition by Chinese investors of a U.S.-based company that develops and manufactures eco-friendly air and water filtering materials. Aifan invested in and raised funds for an Israel-based venture capital fund, invested in and provided business advice to an Israel based financial technology company specializing in inquiry banking, and invested in and advised an Israel- and New York City-based transportation network company engaged in shared rides. She has provided advice to a strategic alliance between a U.S. video-based online transaction platform and a China-based e-commerce company. 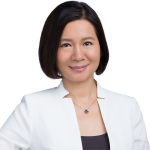 Before joining BGA, Aifan was a senior advisor to the Zhongmen Group, a U.S.-based financial advisory firm dedicated to facilitating institutional-scale outbound direct investment from China to the United States and other global markets. From 2007 to 2013, Aifan was the vice president and general counsel for Alcoa Asia Pacific. She advised management and business staff on legal and business issues across the region in the areas of commercial transactions, direct investment, mergers and acquisition, employment, regulatory and compliance issues. Prior to Alcoa, Aifan practiced law as a transactional lawyer with international law firms such as Morrison & Foerster and Galland Kharasch & Garfinkle, in Washington, D.C., and Beijing. Aifan holds an LLB from Beijing University Law School and an LLM from the George Washington University Law School. Aifan is qualified to practice law in the state of New York and the People’s Republic of China.